The brushless d.c. motor differ from normal d.c. motor in that it employs electrical commutation of the armature current rather than the mechanical commutation. The construction of brushless d.c. motor is similar to a permanent magnet synchronous motor. The polyphase winding is placed on the stator (armature) while rotor consists of permanent magnets. The Fig. 1 shows the cross-sectoinal view of a permanent magnet brushless d.c. motor. The word brushless d.c. motor is used to define the combination of motor, its electronic drive circuit and rotor position sensor. 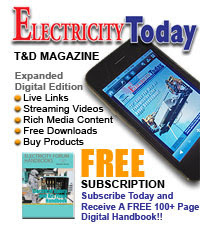 The electronic drive is an inverter which consists of transistors, which feeds stator windings. The transistors are controlled by the pulses generated by rotor position sensors. This ensures that rotor revolves at angular speed which is equal to the average speed of the field produced by the stator. Like a d.c. motor, the drive circuit is fed from a d.c. supply. The stator and rotor fields remain stationary with respect to each other at all the speeds. The torque-speed characteristics are similar to a d.c. motor. The speed can be controlled by controlling the input d.c. voltage. Because of these similarities and as it does not have brushes, it is known as brushless d.c. motor. 2. Bipolar or full wave brushless d.c. motor. In this type, rotor consists of optical sensors. 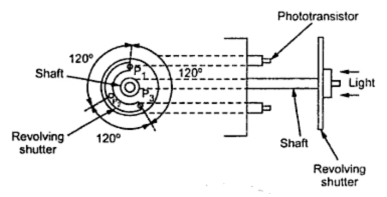 The optical sensor has a light source, three photontransistors P1, P2 and P3 mounted on the end plate of the motor, separated by 120o from each other and a revolving shutter coupled to the shaft of of the motor. The optical sensor is shown in the Fig. 2. The stator consists of a three phase stator winding and a two pole rotor consisting of permanent magnet. The driving circuit consists of three transistors Q1, Q2 and Q3 used to excite the stator windings. The arrangement is shown in the Fig. 3. When the shutter revolves, the phototransistors get exposed to the light in the sequence of their numbers. In each revolution, the phototransistors generate the pulses PI1, PI1 and PI1which have duration and phase displacement of 120o. This is shown in the Fig. 4. When light falls on the phototransistors P1, it generates a pulse and transistor Q1 gets turned on. Hence current starts flowing through stator winding Ph1. This produces north pole at pole face of Ph1. Due to this, south pole gets attracted towards it and reaches the axis of pole face of Ph1. Hence rotor revolves in anticlockwise direction. During the mean time, the light stops falling on P1 and starts falling on P2. Hence pulse PI1 is generated which turns on the transistors Q2. So current now starts flowing through the winding Ph2, producing a north pole. Hence rotor further rotates in anticlockwise direction. So that rotor reaches the axis of the pole face of . In the meantime, light stops falling on and starts falling on P3. 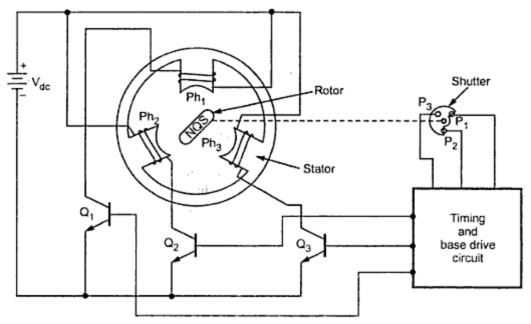 This causes transistors Q3 to turn on which produces north pole at the pole face of Ph3 This rotates the rotor further in anticlokwise direction. Switching sequence repeats and continuous rotation of the rotor is obtained. The torque reversal can not be obtained just by reversing the d.c. supply as in case of conventional d.c. motor. It can be achieved by operating the timing and base drive circuit in such away that the transistors Q1, Q2 and Q3 conduct for the duration of pulses PI2, PI3 and PI1 respectively. The torque reversal can be achieved also by shifting the base drive signals of the transistors by 180 degrees. The circuit does not use any feed back or or free wheeling diodes. This is satisfactory for small motors. In small rated motors, the inductive energy in the phase winding is very small, to cause any destruction to the transistors. The cost of this motor is low and drive circuit is simple. The main limitation of this motor is that it can not be used for power levels above 100 watts. In large power levels, the stored energy in the phase winding inductance is large and hence feedback diodes are necessary. In such cases bipolar brushless d.c. motor is used. The bipolar brushless d.c. motor uses three phase inverter feedback diodes are used to return the inductive energy to the supply. The rotor uses Hall effect sensors to sense the position. Infact three Hall effect senors and a magnet ring from a rotor position sensor. The Hall sensors are 120 electrical apart from each other. Magnet ring is mounted on the rotor shaft and revolves with the rotor. The bipolar brushless d.c. motor circuit is shown in the Fig. 5. The switching of each transistor occurs in response to the rotor position sensor. 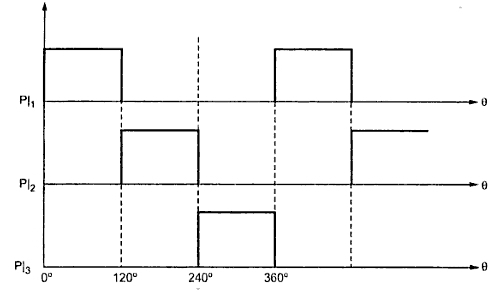 The transistors are triggered in the sequence Q1,Q2 ,Q3 ,Q4 , Q5 and Q6. Each transistors conductors for 120o and at any time two transistors conduct and each pair conducts for 60o. The torque reversal is achieved by phase shifting the transistor base drive signals by 180 degrees. 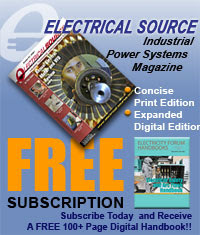 As each phase conducts twice in a cycle, better utilisation of stator windings take place, compared to unipolar drive. The bipolar type is suitable for high performance servodrives and also for the ratings higher than 100 watts. 1. Due to absence of brushes and commutator, they require practically no maintenance. 2. They have long life. 3. The operation is high reliable. 4. They have low inertia and friction. 5. They have low radio frequency interference and noise hence the operation is noisless. 6. Due to low inertia and friction, they have a faster acceleration and can be run at much higher speeds upto 30000 r.p.m. and more. 7. Because armature windings are on stator, the cooling is much better. 8. Due to feedback diodes, the efficiency is as 75 to 80%. The unipolar brushless d.c. motors are used for the applications of power levels upto 100 W like turn drives in record players, spindle drives in hard disk drives in computers and various low cost instruments and computer peripheral equipments. The motors are also used for tape drive for video recorders, instruments and control systems. They also have applications in the field of aerospace, gyroscope motors and biomedical instruments like artificial heart pumps.